Citizen presents a watch with a more functional sense of style featuring a Super Titanium case and stitched strap for more casual style and the dial features large Arabic numerals for even better readability. The watch is powered by Citizen's proprietary solar charging technology which allows it to be powered by light. Award-winning Eco-Drive technology converts the power of light into energy. 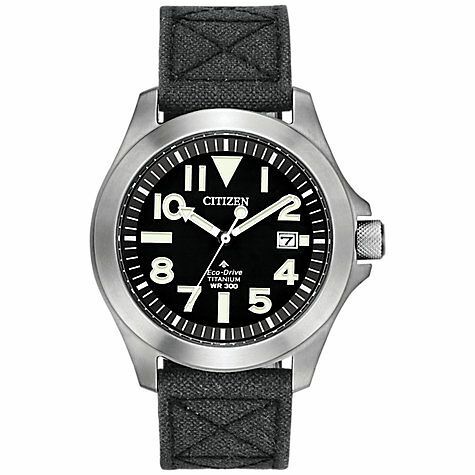 Citizen Eco Drive Men's Black Strap Watch is rated 5.0 out of 5 by 1. Rated 5 out of 5 by Anonymous from Rugged and dressy at the same time I initially bought this Citizen Ecodrive simply for walking and hiking (in all weathers) in the UK's Lake District. I was attracted by its super-titanium rugged build, water-resistance to 300m and great legibility, not to mention its super-accurate, battery-free Ecodrive movement and 5-year guarantee (actually 6-years after I'd registered it). To my surprise, I find that it's also great to wear with a suit; its matt-finished, lightweight titanium case looks fantastic in an office-environment and the fabric strap gives it a truly modern look and feel. Furthermore, with a diameter of 40mm, its size will suit most wrists. In addition, and a sign of quality construction, I didn't expect that its sweep-second hand would be PERFECTLY aligned with the seconds-markers, making it possible for completely-accurate timing adjustments. I don't know whether this applies to every example - but it certainly does to mine! Verdict: a truly-versatile and high-spec watch suitable for all occasions. Great value!